On January 1st, 2001, shortly after midnight, a fire broke out in a Dutch café in Volendam, where several hundred young people were revelling in the New Year’s celebrations. The highly inflammable Christmas decorations caught fire and in no time the packed café was transformed into a living hell. Fourteen youngsters – some only fourteen years old – were trampled to death, suffocated or burned alive. Some 180 people were wounded, many seriously. Young people were disfigured for life and became disabled as a result of the serious burns in their faces and over the rest of their bodies. So many people needed urgent treatment that the Dutch burns units in Beverwijk, Groningen and Rotterdam couldn’t cope. Which is why many of the injured were brought to the neighbouring countries of Belgium, Germany and England. In one fell swoop, Volendam, a traditional eel-fishing village with a population of 22,000 rooted in strong Christian traditions was transformed permanently into a world-famous yet heavily scarred community. 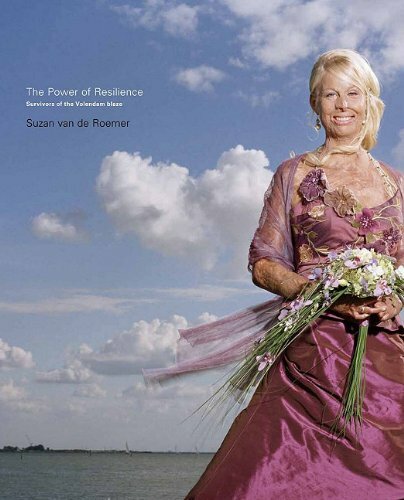 In 2003, three years after the fire, photographer Suzan van de Roemer made portraits of 27 of the fire victims. Without a trace of sensationalism, just as they were. She also talked with them about their hopes for the future. The exhibition of this work in the Melkweg Galerie in Amsterdam, and later at other locations in the Netherlands, was an overwhelming experience, leaving an indelible impression on both those portrayed and on the visitors. This was the first time this group of people had opened themselves up to the world outside their native Volendam. The exhibition resulted in a close bond being forged between the photographer and the group. That contact flourished and was maintained, resulting in Van de Roemer taking shots of the group again seven years later – ten years after the fire. The youths have now become young adults and have shown more resilience than was generally expected. How is it possible to have such a positive attitude, while so much damage has been done? Are they still in pain? How have they managed to overcome their rage? How have they been able to cope with their frustrations? What lives are they leading now? How are their parents? How do they view the future now? The strength and will to live seem to be many times stronger than the problems encountered through physical and mental damage. There is life after the fire – however improbable that may have seemed ten years previously.